Update 6:50 p.m. Flash flood warning for Iron County added. ST. GEORGE — The National Weather Service has issued flood warnings as storms pass through Southern Utah and northwest Arizona Sunday evening. 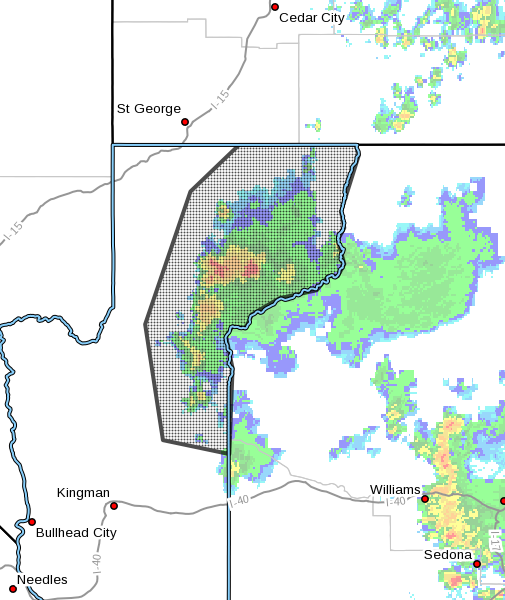 The National Weather Service in Salt Lake City has issued a flash flood warning for east central Iron County in Southern Utah in effect until 9:15 p.m. MDT. At 6:19 p.m. MDT, Doppler radar indicated that heavy rainfall has been falling over the Parowan Creek portion of the Brian Head burn scar. Radar estimates indicate that over 1 inch of rain has fallen on the burn scar over the past hour. It is expected that this amount of rainfall will result in flash flooding and a debris flow through the Parowan Creek drainage including Benson, Center, Bowery, and Soda Springs side drainages. State Route 143 is expected to receive debris, as well as locations along Parowan Creek downstream to the town of Parowan. People in this area should take action to ensure their safety! The debris flow can consist of rock, mud, vegetation and other loose materials. The National Weather Service in Las Vegas has issued a flood advisory for northeastern Mohave County in northwestern Arizona affecting Colorado City and Grand Canyon National Park, among other areas. The advisory is in effect until 6:30 p.m. MST Sunday. 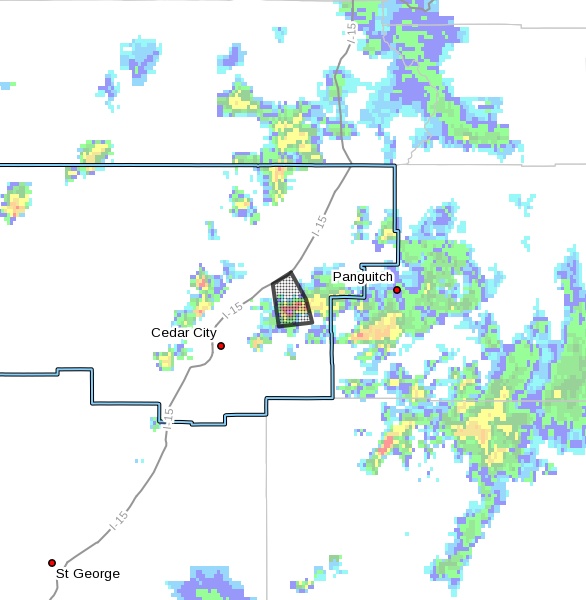 At 3:26 p.m. MST, Doppler radar indicated heavy rain due to thunderstorms over the Mount Trumbull Loop that will likely cause minor flooding. Additional storms may develop through the afternoon near Peach Springs and Colorado City, which may result in a localized flood threat as well. Some locations likely to experience flooding include Colorado City, Kaibab, Bar Ten Ranch, Grand Canyon Skywalk, Pipe Spring, Diamond Creek Campground, Mt. Trumbull, Toroweap Campground, Grand Canyon National Park, Peach Springs and Tuweep. If a debris flow has occurred, it is important to realize that the runout area remains very dangerous. Additional debris flows may occur within minutes of the original flow. Please remain vigilant and be prepared to take swift action. People in the warning area are advised to move to higher ground immediately. Residents living along streams and creeks should take immediate precautions to protect life and property.